I had just undergone surgery to remove a tumor from my abdomen and yet another to open up both of my legs after an infection post op raged through my body requiring an additional 10 day hospital stay. I had fresh incisions from my knees to my groin on the inside of both legs and stretching across my lower abdomen. I had a catheter, a drain to remove blood and fluid inserted into both legs on the inside of my knees and another to drain fluid from my abdomen. I was covered in blood soaked 4 by 4 inch gauze bandages and hooked to IV antibiotics and pain medications. If I could've moved around more I probably would’ve felt constricted by all of the tubes coming in and out of me, but I wasn’t in any shape to even turn over on my side. I was hurting in every sense of the word, both inside and out. I had always aspired to be a helpful person, a strong person. Someone others could count on, lean on, confide in and depend on. I thought I had pushed the memories of that time in my life almost four years ago, away. Confident I had conquered what I was supposed to physically and hopeful that I was on the right path spiritually until I found out last week that I need to have surgery again. My first thought was, I just can't do this again. I'm not strong enough. It would be so much easier to just give up. Then I remembered the beautiful blessings that came from my brokenness, the life lessons I wouldn’t have learned any other way. Chances are very good that you are a way better care partner than you might think you are. 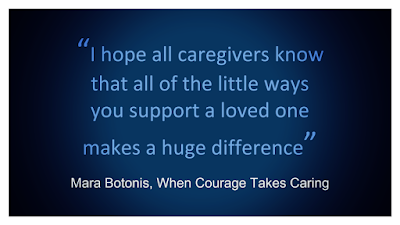 I hope you know that all of the little ways you support a loved one make a huge difference. Trust me. Click here to find the book. If you can’t fix everything right now, fix something. One night in the hospital just before I was discharged, the night nurse on her rounds found me crying in my room. When she asked what was wrong, I had a big list and between sobs I blurted out, "I hurt so much, and I don’t know what’s going to happen to me and I'm going to look like Frankenstein the rest of my life with all of these hideous scars, and I'm stuck in here and I don’t know when I'll get out and I can't even wash my hair." She listened and after a moment, said something I'll remember the rest of my life, "Well honey, we can't fix everything right now, but we can fix something". She left my room for a moment and when she came back in, right then and there at a little after two in the morning, she loving washed my hair in a basin while I lay in my hospital bed. It didn’t solve all of my problems, but it sure fixed one and that was enough to get me through the rest of that night. Don’t underestimate the calming effect of your companionship. When we were little, my Mom gave my brother and I this old bell to put by our beds when we were sick. She told us we could ring it anytime and that no matter where she was, her sensitive mother's ears would always hear our call and she would be there in a flash. I'll admit to abusing this privilege as kid, ringing the bell to tell her that Looney Toons was a bunch of re-runs was the definition of abuse of power. I'm sorry Mom. That bell holds a place of honor on my bookshelf. Nearly 4 decades after she first gave it to me. In my saddest moments or during my most difficult struggles, looking at that bell assures me that we're in this together. I know that whatever I'm going through, I'm not alone and there is an undeniable calm that comes over me just knowing her gift of companionship will always be with me. Try a little tenderness. During my recovery at home, one of the most meaningful gifts I have ever received was the care my husband gave me. In between home health visits from the wound care nurse, physical therapist, nurse, and care aides it was my husband, Dave that did everything else. The person that knows me best and most intimately, but I was still very embarrassed and uncomfortable being before him in such a vulnerable way when I needed help with bathing or toileting. He was so respectful of my privacy, carefully covering me up and tenderly letting me do as much as I could on my own or asking me what I needed or how I wanted it to be accomplished if I couldn’t do it myself. His tenderness offered me the maximum amount of dignity in each care task and it made it more comfortable for me to accept the help I needed. Caring for the person is as important as caring for the patient. There were a lot of times during my recovery period that I didn’t have a lot of choices. Medically things had to be done at certain times, in a certain way by a certain person based upon doctor's orders. We had a revolving door of home care staff, scheduled medications and wound care treatment every few hours and a steady stream of scheduled medical appointments. Having other people decide so much a part of how my days would go made me feel helpless and frustrated. The best parts of my day were the ones where I got to feel like a person and not a patient. I craved conversation about things that mattered before I got sick, I wanted to do something fun-anything. Music, movies, photo albums of happier times and phone calls with friends became the best part of my day because they took me to a time and place that reminded me that I was a whole person instead of a collection of care needs. A little understanding goes a long way. When you're hurting you're not yourself. Physical pain and the emotional distress that comes with illness left me feeling a range of emotions that changed faster than the weather. I would have a good start to the morning and then maybe try to put on my own pants only to fall over or have such a sharp stab of pain that I felt like I couldn’t breathe. When this would happen, I would lash out. Sometimes cross words came out of my mouth that found their way to the nearest person even though I knew it wasn’t their fault. I was upset about the situation not with anyone else. I would immediately be filled with shame for my behavior and would quickly apologize and ask for forgiveness on these occasions. 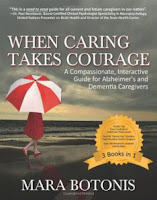 It meant so much to me that the care team offered me so much patience and understanding. Never holding onto any emotional hurt I may have caused by snapping at them, they gave me a clean slate every time they came into my room and it meant the world to me. This time around, (I'm going to into surgery again next week) I'm better prepared to be a more grateful patient. 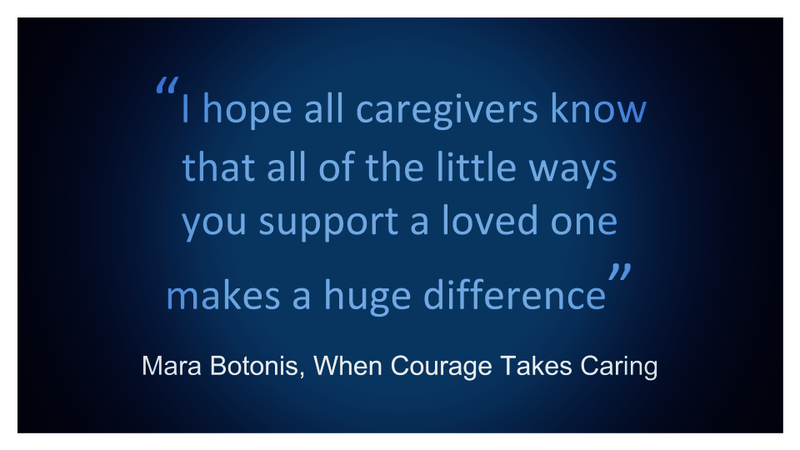 I also know that in the years between these medical events, the times I have been broken have helped prepare me be a better caregiver.